Any time a new pesticide is registered for use on a food or feed crop in this country, the U.S. Environmental Protection Agency (EPA) establishes a maximum residue level (MRL) for that crop protection product and crop. In simple terms, MRLs are the highest levels of pesticide residue legally tolerated in or on food or feed. It sounds straightforward, but as countries around the globe modernize their food standards programs, they often establish their own national MRLs, which may be different from those established by the EPA. The potential gap between U.S. approvals and foreign Import Tolerances (ITs) or MRLs is a trade issue that affects all pesticides. With one out of every three planted U.S. acres bound for export, the lack of global MRL harmonization is a growing concern. MRLs are always set at far lower levels than any toxicologically significant levels; and because of this approach, residue levels are not about safety, says Heidi Irrig, North America MRL and senior regulatory manager for Syngenta. The method regulators use to calculate MRLs ensures a wide safety margin. First, researchers conduct multiple field trials under the principles of Good Laboratory Practices to determine the maximum amount of residue that could remain on the crop, when growers apply the pesticide according to the product’s label instructions. Then, authorities like the EPA look at consumption data—how much a person might consume in a day or a year—to calculate realistic exposure scenarios. This risk-based model of assessing the hazard of a chemical and probable exposure from dietary consumption is the legal standard in the U.S. and many other countries—including Japan, Canada, Australia and New Zealand—and it’s consistent with obligations under the World Trade Organization (WTO). “In the case of agriculture, the WTO requires members to base their measures on an assessment of the risk, and risk is defined by the Codex Alimentarius Commission (Codex) as hazard times exposure,” says Daniella Taveau, a former trade negotiator with the EPA. The Food and Agriculture Organization of the U.N. and the World Health Organization established Codex as the body to protect consumer health and promote fair practices in food trade. Importantly, WTO membership requires adoption of Codex standards, unless a country has scientific justification for deviating from the standard. Organization established Codex as the body to protect consumer health and promote fair practices in food trade. Importantly, WTO membership requires adoption of Codex standards, unless a country has scientific justification for deviating from the standard. “But many countries continue to maintain protectionist regimes by establishing measures related to MRLs that are really a guise for restricting trade,” she adds. For example, the European Union (EU) has one of the most trade-restrictive frameworks in the world when it comes to MRLs and agricultural biotechnology. At the heart of the EU regulatory framework is a hazard-based approach. “EU regulators have said they’re not going to take exposure into consideration,” Irrig says. “If a chemical is hazardous, they just don’t review it any further.” A lot of chemicals probably won’t pass these hazard-based criteria, she adds. Fortunately, progress toward harmonizing MRLs around the world continues to occur. Recently, there was an important breakthrough with MRLs, which positively affects the ability of more potato growers to use Elatus® fungicide. On January 28, 2019, the MRL of 0.02 ppm [parts per million] was officially established in Taiwan for benzovindiflupyr, the same as the U.S. MRL. Elatus also has a Section 2(ee) label for Verticillium wilt, which no other fungicide in the potato market has. A 2(ee) provision allows growers to use pesticides under certain limited conditions that are not specified on the label. Having MRLs established around the globe could help eliminate such issues, and there’s work going on toward making that happen, Irrig says. 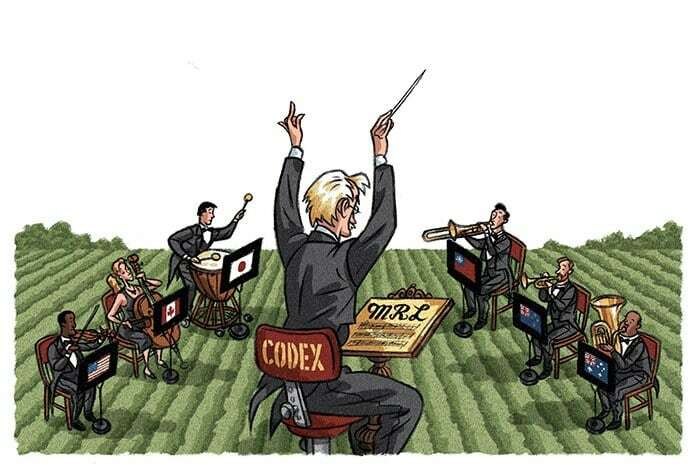 Codex, comprised of independent science reviewers from governments around the world, establishes MRLs (known as Codex MRLs or CXLs) for use by countries that do not have national food standards programs or establish national MRLs. The Organization for Economic Cooperation and Development, made up of 36 member countries, is another venue working on standardizing testing and data requirements used to establish MRLs. Meanwhile, organizations like CropLife America and CropLife International, which are composed of agricultural chemical registrants, are discussing ways to facilitate and advance harmonization. Syngenta participates in and supports those efforts, too. The potential gap between U.S. approvals and foreign import tolerances or MRLs is a global trade issue that affects all pesticides. The approach of Syngenta regarding MRLs is all about transparency and engaging proactively with our channel customers, growers and exporters to present current MRL information. Syngenta is engaged in ongoing international efforts to harmonize MRL standards. As MRLs may change from time to time, please check with the Environmental Protection Agency and U.S. Department of Agriculture Foreign Ag Service Global MRL Database for a complete list.